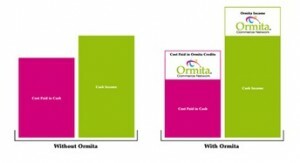 Ormita Israel is income supplemental to the cash already being generated by selling to existing cash-paying customers. Ormita Israel customers do not replace cash customers, instead they are incremental (new) income. We bring new customers to your business through our own marketing activities. These new customers make purchases and generate new revenue. This additional revenue is used to pay for existing costs, expansions, improvements and new acquisitions. Ormita Israel saves cash by offsetting expenses. It is not meant as a replacement for cash and cannot be used to pay Sales Tax and fixed expenses. Once those expenses are covered, however, by existing cash business, then every additional customer through is new revenue, with a higher margin of profit.